Well, after weeks of delays, I have FINALLY completed the latest in my hymn-inspired series of collages. 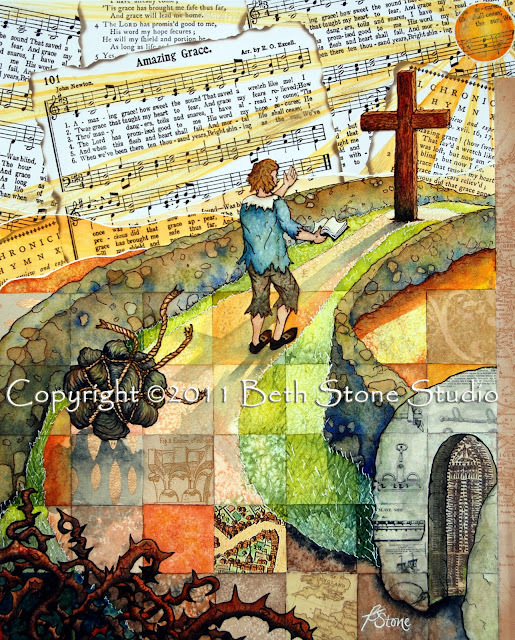 This piece is based on the hymn, "Amazing Grace," by John Newton. because of the load on his back. in, and I saw it no more. should give it in at the Coelestial Gate. So they went their way. Below are the lyrics to "Amazing Grace." Oh Beth, this collage is beautiful!! I love both the story and the hymn! it's very moving, my heart was touched, we so easily forget, where we all have to start...and where we constantly have to remind ourselves of...it's by Grace...and not ourselves that we are saved..love the colors and composition..and hope many peoples lives will be touched by your work..
Beautiful, Beth - you really outdid yourself on this one! AMAZING, Beth! (No pun intended... Should have come up with a better adjective.) You are so creative and talented. I could never come up with something like this! !